In the last month, the Foundation has focused its efforts on addressing and highlighting the gender dimension of climate change in the run up to negotiations at COP 17. In the last month, the Foundation has focused its efforts on addressing and highlighting the gender dimension of climate change in the run up to negotiations at COP17. At a recent meeting of the Troika+ of Women Leaders on Gender and Climate Change, hosted by the Foundation on the side-lines of the United Nations General Assembly in New York, women leaders came together to discuss how they can use their leadership roles to bring gender and climate change from the side-lines to the centre of economic, social and environmental decision making, thus facilitating commitments into actions. Attendees at the meeting agreed on the need to emphasise the role of women as a force for transformation as the world emerges from the financial crisis while stressing the need to recognise the links between climate change, sustainable development and poverty reduction. 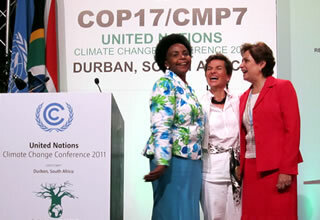 To maintain the momentum for a greater gender dimension to climate change solutions, Minister Nkoana-Mashabane indicated that a programme of activities on women’s leadership running parallel to the negotiation’s at COP17 is being planned; both Minister Nkoana-Mashabane and Mary Robinson stated their commitment to co-host a high level event of women leaders on gender and climate change during COP 17 in Durban. President of the Foundation, Mary Robinson, delivered the prestigious Magnusson Lecture on 7 October at Glasgow Caledonian University, entitled Climate Justice – Challenges and Opportunities. In her lecture, Mrs Robinson highlighted the gender dimension of climate justice saying that women’s contribution is central to tackling climate change and “requires the energy and resourcefulness of women’s leadership to tackle it”.